Basically, a natural arch is a rock formation with a hole in it. Where can Natural Arches be found? Natural arches can be found all over the world. Some of the largest arches are located in China, but Arches National Park in Utah claims to have the highest concentration of natural arches. Outdoor enthusiasts of all ages and experience can visit many of the natural arches and bridges in Utah's national parks like Arches National Park, Bryce Canyon National Park, Canyonlands National Park, Capitol Reef National Park, and Zion National Park. Additional natural arches can be found in the Grand Staircase-Escalante National Monument, Natural Bridges National Monument, and Glen Canyon National Recreation Area. Another major area of Utah, the San Rafael Swell, is not only a haven for hikers and canyoneering but also includes a variety of natural arches and bridges to enjoy along the trail. 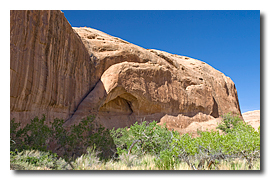 At 808 natural arches and bridges, UtahArches.com offers the largest, free access, collection of Utah's natural arches on the internet. If you are tired of doing the same old boring things, looking for something new and exciting, want an activity to do that is outdoors and is healthy for you, then try searching for natural arches and bridges. Arch hunting is more than looking for holes in rocks; it is also the adventure along the way that makes this a worthwhile and popular hobby.